This space is frequently filled with exciting news about area businesses, but it's my duty to also share the not-so-good developments. Such is the case this week with word that Mr. Ritt's Gluten Free Bakery in Millville is shutting its doors by the end of July. The bakery's website is sketchy on the reason for the closing, but notes that baking will continue at least through the end of May. 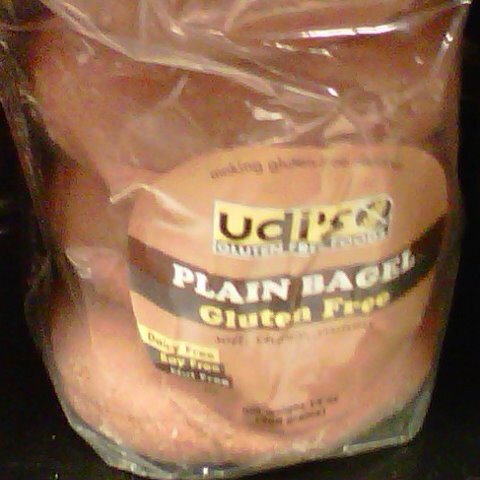 I remember taking my older son to the bakery shortly after he was diagnosed with celiac disease - when the store was located in Philadelphia - at a time when there was a dearth of tasty gluten-free baked goods available. I watched with joy as he sampled a fresh blueberry muffin right out of the package before we left the store, and I know many others have had similar experiences there. Thanks to Richard and Paul for their contributions to the gluten-free community over many years. In recent years other gluten-free bakeries have joined Mr. Ritt's in serving celiacs, including The Grain Exchange in Doylestown. On Tuesday, I posted my review of several of the bakery's baked goods. Congratulations to reader Nina, whose name was randomly selected as the winner of the recent Purely Elizabeth baking mix giveaway. Thanks to all who entered. Philadelphia is home to restaurants from three "Iron Chefs." I've written recently about Bobby Flay's burgers at his new Burger Palace. Many of Jose Garces' restaurants now have gluten-free menus, including Tinto, Amada, Distrito and Chifa. (They're linked at the Gluten Free Philly restaurant list.) Now comes Masaharu Morimoto. Sushi and other items at his eponymous Japanese restaurant (723 Chestnut Street, 215-413-9070) can be made without gluten. The kitchen also has gluten-free soy sauce. In Blue Bell, Gianni Brothers (700 DeKalb Pike, 610-272-2009) serves up prepared gluten-free "deli-cacies" (my bad pun, not theirs!) like chicken salad, tuna salad, baked fish and crab cakes. Their foods are available for dine-in and take-out. Thanks to reader Jessica for the good word on this eatery. Joe Palombo's Mirabella Cafe in Cherry Hill has gluten-free and gluten-free-by-request options on its Mother's Day dinner menu, including Crispy Suzuki - pan-seared Japanese black bass with Taylor Bay scallops in an herb broth. Virago Baking Company & Cafe will be moving in July onto Lansdale's Main Street, with a new location at 322 West Main Street. News of the move was reported last week in the North Penn Reporter. Have I gushed enough about General Mills? From gluten-free Chex cereals to Betty Crocker baking mixes, the company has shown its commitment to our specialized marketplace. 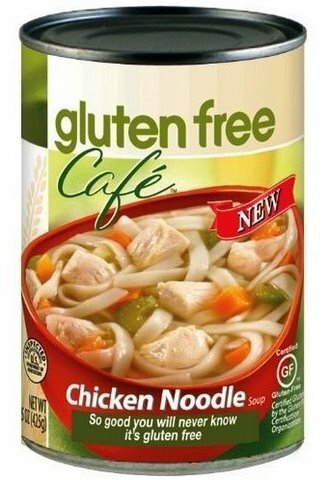 The company has just announced that gluten-free Bisquick will begin shipping in July, preceded by reformulated Hamburger Helper mixes (chicken fried rice, beef fried rice and cheesy hashbrowns) in late May. Area children with celiac disease can participate in a family camping weekend on June 19 and 20 [Updated: due to a schedule conflict, it's now scheduled for June 26 and 27]. A local family has volunteered to run the event at Camp Kettle Run, a Girl Scout camp in Medford. Tents will be provided, so campers only need to bring sleeping bags or bedrolls, pillows and blankets. The cost is $25 for each family tent. Each child will need to have a parent with them for the weekend, and siblings are welcome. Activities will depend on the ages of the children in the group, but will range from craft projects to a nature hike around Kettle Run to a trip to Woodford Wildlife Refuge. The event will run from 10 a.m. Saturday to noon Sunday, rain or shine. Gluten-free meals will be provided for lunch and dinner on Saturday and breakfast on Sunday, along with s'mores at a Saturday night campfire. Each family is asked to contribute toward the cost of the food. For more information and to register, call Kathy Borton at 856-802-0822. The Gluten Free Delaware support group is holding a potluck dinner this Sunday, May 2 at 5 p.m. in Newark. E-mail Debra Burke to register and to get location information. I am back in the City of Brotherly Love from a business trip to Chicago, one of my favorite cities in the U.S. and, like Philadelphia, a great gluten-free town. I returned with some Lemon Buttons made by local bakery Deerfields Gluten Free for the Gluten Free Philly staff, and the cookies were scarfed down pronto. Soft, not too tangy, and less calories and fat than some of the other varieties. With my return came another Goodies Giveaway. This time around, a sampler of the four baking mixes from purely elizabeth is up for grabs. Post a comment by Sunday night and you'll be entered to win. Big Fish Grill on the Waterfront in Wilmington (720 Justison Street, 302-652-3473) is now a part of the Gluten-Free Restaurant Awareness Program (GFRAP), as is its namesake location in Rehoboth Beach. All of the meats and sides (except for the corn bread and macaroni & cheese) are gluten free at Jimmy's BBQ in Malvern (309 Lancaster Avenue, 610-879-8805). Thanks go to reader Mawrter for that tip. Now for some updates: The falafel at all U.S. locations of Maoz (with two Philly spots) is now gluten free. The chain is looking into gluten-free breakfast and dessert options. Over the weekend, the Gluten Free Philly gang checked out Bobby's Burger Palace in University City. Both a reader and I previously were told that the milkshakes and malteds were made using different equipment. However, a manager I spoke in person during our visit told me that malteds are made using the same blenders. Conditions are always subject to change, so check with a manager before ordering shakes there. Speaking of the GFRAP, all locations of The Melting Pot, including those locally in Philadelphia, King of Prussia, Warrington, Atlantic City and Wilmington, are now listed. In addition to the gluten-free pizza that's been on the menu for several years, Main Line Pizza in Wayne now offers baked chicken wings and lettuce-wrapped steaks and sandwiches. Although Deliteful Foods in Lawrenceville recently closed its neighboring café, the owners moved the non-gluten-free foods into that space so that the original store is now dedicated entirely to gluten-free items. Glutenfree.com is currently offering 20 percent off purchases with code WELCOME20. There, you can find many products from Ian's, Gluten-Free Pantry and Glutino, including the latter's new chocolate- and yogurt-covered pretzels, which are not yet in stores. From the Unsolicited Plug Department: A new cookbook from fellow gluten-free blogger Vanessa Maltin was published this week. Her new book, The Gloriously Gluten-Free Cookbook: Spicing Up Life with Italian, Asian and Mexican Recipes is now available at Amazon.com and at clicks-and-mortar bookstores. Vanessa is a tireless advocate for gluten-free awareness and I hope you can support her efforts! UPDATE: 4/28/10 @11:14 p.m.: Congratulations to reader Nina, whose name was selected at random as the winner of the giveaway. Thanks to all who entered. Since childhood, native Philadelphian Elizabeth Stein strived to be a healthy eater, but has long had a soft spot for homemade baked goods. While pursuing a career as a holistic nutrition counselor at the Institute for Integrative Nutrition, she learned about the connection between what you eat and how you feel; how sugar, wheat and dairy (the key ingredients of her favorite treats) can negatively impact health. With her enthusiasm for sweet treats diminished, she sought to create a better option. Her mission was to recreate homemade baked goods using ingredients that were not just "healthy" but actually beneficial for the body, filled with vitamins, minerals and nutrients. In September 2009, she launched purely elizabeth, a line of gluten-free and vegan baking mixes made with whole grains and “superfoods” (hemp, flax and chia seeds) and also free of sugar and dairy. The company’s products include Ultimate Cacao Muffin Mix, Blueberry Maple Muffin Mix, Apple Spice Muffin Mix and Perfect Pancake Mix. The products are packaged on equipment used exclusively for gluten-free products. All of the raw ingredients come certified by her suppliers to be free of gluten. The mixes are available locally in Philadelphia at Essene Market, Healthy Bites and Milk & Honey Market, in Jenkintown at Curds & Whey, and in Dresher at Shop n' Bag. They can also be ordered at purely elizabeth’s website, with flat-rate $4.95 shipping. 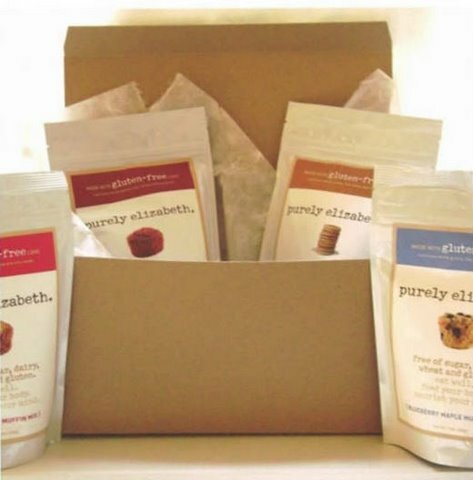 Elizabeth has generously offered a Gluten-Free Gift Sampler, containing one package of each mix, to give away to a lucky Gluten Free Philly reader. To enter the giveaway, leave a comment to this post about the one purely elizabeth mix that you’d most like to try. The giveaway runs now through Sunday, April 25 at 11:59 p.m. Eastern Time. I’ll randomly select one winner the next day and will contact him or her by email. If I don’t hear back from the person with his or her mailing address by the following Tuesday at 8 p.m. Eastern, I’ll select another name. The Phillies began their quest for a third straight pennant this week, and the home opener next week surely will be exciting. We went to one of the exhibition games last week and learned that the gluten-free offerings at Citizens Bank Park have been expanded a bit. Chocolate-chip cookies from Good Eatz are now at the concession stand behind Section 128. Redbridge beer and Woodchuck cider are also available at the same location - a welcome change from having to buy gluten-free food at one stand and drinks at another. You might have to squint, though, to spot the gluten-free menu there. I wrote this week about some Pennsylvania snack food companies that offer factory tours to visitors. Reader Sue mentioned in an e-mail that Dutch Country Soft Pretzels in New Holland, Pennsylvania, which makes a gluten-free twist, offers tours of its facility. Firebirds Wood Fired Grill, a chain with a northern Delaware location in Newark (1225 Churchman's Road, 302-366-7577), has a gluten-free menu featuring salads, steaks, ribs and sides. At the Echelon Mall food court in Voorhees, Deux Au Naturel (1565 Voorhees Town Center, 856-772-2008) can prepare a variety of wraps with gluten-free ivory teff tortillas. Lotus Garden, serving Chinese and Japanese cuisine in Newtown (2106 South Eagle Road, 215-860-0310) has gluten-free noodle dishes and other items. Reader Aileen, who told me about the place, posted a review on Chowhound. Reader Elle shared news about two Philadelphia restaurants. She wrote to tell me she ordered crustless mahi-mahi over rice at Bridget Foy's (200 South Street, 215-922-1813), which was able to accommodate her request for gluten-free dining. At Jose Garces's Latin tapas bar Tinto, she ordered from the chef's tasting menu. Tinto also has a separate gluten-free menu. Philadelphia's Little Fish, the sister restaurant of Fish, closed last week due to structural issues with the building, according to the Inquirer's Michael Klein. Owner Mike Stollenwerk may relocate the seafood restaurant and open elsewhere in town. It's about time one of those mall-based cookie shops had a gluten-free selection. 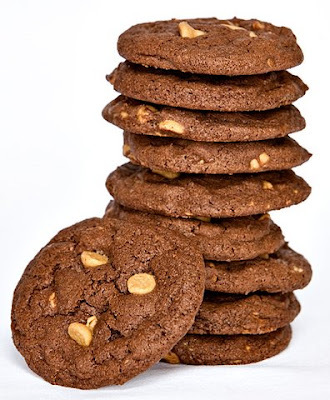 Great American Cookies offers a gluten-free version of its Chewy Chocolate Supreme cookie. The only store in the area - at the aforementioned Echelon Mall - currently doesn't offer it but store owners company-wide have the option of carrying the gluten-free cookie, and may do so if customers request it. A company rep told me that the gluten-free cookies are made before the wheat-containing ones on clean equipment. Last week, I mentioned that Snyder's of Hanover is planning to bring certified-gluten-free pretzel sticks to market. The pretzels, also free of dairy, casein and egg, will be available nationally in July, although a few markets may have them before then. The product will be sold in 8-ounce bags for between $3-$4 each. One serving contains 1.5 grams of fat, less than the comparable Glutino pretzel sticks. The equipment at Snyder's undergoes a GFCO sterilization process before the pretzel sticks are produced to ensure they meet the GFCO standard of less than 10 parts per million of gluten. Bob's Red Mill has - ahem - rolled out gluten-free Quick Cooking Rolled Oats and Whole Grain Oat Flour. Back in February, I wrote about Glutino's new gluten-free cereals that were in the works. 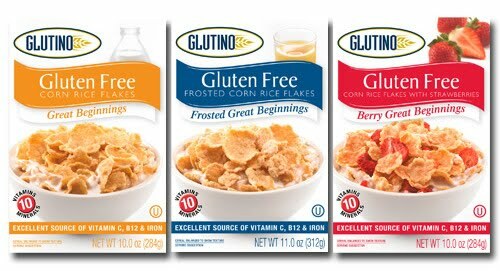 The three corn-and-rice flake cereals are called "Great Beginnings" and come in Original, Frosted and Berry varieties. They should be in markets within the next few months. 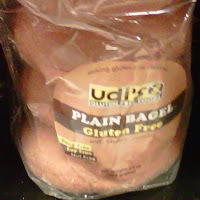 Udi's new gluten-free bagels are now in area Whole Foods markets, along with cinnamon rolls and both of its bread varieties. I spotted them at the Marlton store, while reader Carol wrote in to tell me that the Wynnewood location has them. The bagels also can be ordered online direct from the company. The bagels are soft and chewy and, like the breads, don't need to be toasted first. They're my son's new favorite. The Devon Whole Foods is hosting a gluten-free fair on Saturday, April 17 from 1 p.m. to 3 p.m. The store will offer plenty of food samples and have a raffle too. The Mercer County Celiac Support Group's April meeting will be held at the Princeton Whole Foods on Wednesday, April 28 at 7 p.m. Bring copies of your favorite gluten-free recipes to share with other attendees. I'll be out of town most of next week but there will be a News & Notes post on Friday (I'll have deets on Bobby Flay's new Philly burger joint), followed by a new giveaway announcement the following Monday. Stay tuned! 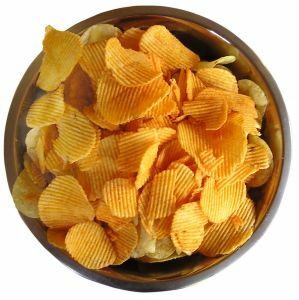 Pennsylvania leads all other states in the production of potato chips, with York County - about two hours west of Philadelphia - claiming the title of "Snack Food Capital of the World." The county is home to two familiar snack food companies that sponsor free factory tours. Visitors can see the making of the famous Utz potato chips at the company's 600,000-square-foot facility in Hanover. Utz [GF product list] has built a glass-enclosed observation gallery that looks down on the production process from beginning to end. Guests are guided step-by-step with the aid of a push-to-talk audio program and closed-circuit TV monitors. A wall display of Utz’s history enhances tourists' understanding of the company and its products. The Utz tour hours are from 8 a.m. to 4 p.m., Monday through Thursday. For Friday tour possibilities, call 1-800-367-7629 the Wednesday prior to the Friday you are interested in. There is no minimum age requirement for participants. Snyder's of Hanover [GF product list], which will soon offer gluten-free pretzel sticks, has a free in-house tour of its manufacturing facility revealing how pretzels and potato chips are made. On the guided walking tour, visitors will see the raw material warehouse, finished goods warehouse (where robotics are at work), and the state-of-the-art packing room. The one-hour tour starts and ends at the Factory Store. Tours are conducted on Tuesdays, Wednesdays and Thursdays at 10 a.m., 11 a.m. and 1 p.m. year-round. Reservations are required at least 24 hours in advance. To schedule a tour, call 1-800-233-7125, extension 8592 on Monday through Friday 9 a.m. to 5 p.m. All participants must be at least 5 years old and able to climb stairs. In Nottingham in Chester County - a bit closer to home - guests on the free factory tour at Herr's [GF product list] can observe the manufacturing process for different products while learning little-known facts like how a pretzel gets its brown color, what makes a great chipping potato, and how tortilla chips get their seasoning. The one-hour tours run on Mondays through Thursdays from 9 a.m. to 11 a.m. and from 1 p.m. to 3 p.m. The tours also are available on Fridays from 9 a.m. to 11 a.m., although the company can't guarantee production running on those days. Tours more than 24 hours in advance can be scheduled online; if within that time, reserve by calling 1-800-637-6225. No photography is allowed on any of the walk-throughs, which are not offered on major holidays. It was a busy week in the local gluten-free world, what with the Sixers celiac awareness night last Friday, Sunday night's dinner at Sauté dinner and Wednesday night's "Cupcakes & Cocktails" fundraiser at APO Bar+Lounge. 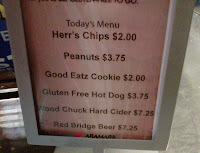 We went to the Sixers game, where Aramark served a delicious gluten-free pasta dish in addition to the always-on-the-menu hot dogs and chicken sandwiches. I wasn't able to attend the "Cupcakes" fundraiser because I was in Cleveland on business. While there, I saw a legit NBA team in the Cavaliers at the Quicken Loans Arena, which has a concession stand with gluten-free pretzels. On Tuesday, I wrote about the gluten-free vegan burgers from Asherah's Gourmet in Doylestown. Healthy Bites To Go Market in Philadelphia will be offering samples of the burgers on Sunday, April 11 beginning at 11 a.m.
Lots of restaurant and product news to, um, digest this week. The Golden Inn in Avalon (7849 Dune Drive, 609-967-2111) has gluten-free options at its casual Luigi's Pasta & Vino and at its more formal Dining Room. The restaurants were profiled a couple weeks ago at MontgomeryNews.com. For those of you who plan to vacation further up the New Jersey coastline this summer on Long Beach Island, stop for gluten-free pizza on the way there at Pietro's Pizza in Manahawkin (712 East Bay Avenue, 609-597-6708). Quakertown now has its own Five Guys Burgers & Fries (254 N.W. West End Boulevard, 215-536-0555) to know and to love. Among the gluten-free-friendly restaurants participating in the South Jersey Restaurant Week from April 11-16 are Andreotti's Viennese Cafe (Cherry Hill), Blackbird (Collingswood), Casona (Collingswood) and La Campagne (Cherry Hill). The special four-course menus during the event run between $25 and $35. National sandwich chain Jason's Deli, with an area location at the Upper Dublin Shopping Center in Willow Grove, is surveying customers on their interest in gluten-free sandwiches. Let the company know of your interest and share your comments. 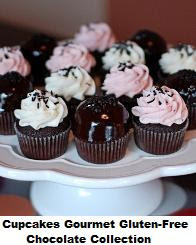 Gluten-free milk chocolate, vanilla and red velvet mini cupcakes are available on Fridays and Saturdays at Cupcakes Gourmet in Malvern (288 Lancaster Avenue, 484-318-8057) and Wayne (279 East Swedesford Road, 610-688-3144), where they're mindful of cross-contamination. The chocolate-flavored minis, with three different buttercreams, can be ordered online and shipped nationwide. Thanks to reader Karin for the tip. In Elkins Park, gluten-free cookies are baking at Once Upon a Cookie (215-880-6751). Owner Tracy Brown uses organic rice flour for her moist, chewy gluten-free chocolate chip cookies. The gluten-free treats are made before any glutenous ones using clean equipment and utensils. They can be found at Weavers Way Co-op in Philadelphia and can also be ordered online or by phone and delivered locally. South Jersey's Courier-Post newspaper mentioned Sweet Freedom Bakery, Mr. Ritt's, Tesori's Gluten Free Treats, DiBartolo Bakery and Simplicity Desserts in an article Wednesday on local bakeries offering gluten-free cakes and other sweets. I was interviewed for the feature story, which appeared in the paper's Taste section. Speaking of gluten-free pretzels, Snyder's of Hanover confirmed yesterday on its Facebook page that the company's new pretzel sticks will be certified by the Gluten-Free Certification Organization, whose standard is less than 10 parts per million of gluten. The company did not announce when the product will be launched other than to say it is "coming soon." Hain Celestial last year created a dedicated, certified line of gluten-free products called Gluten Free Café. The first products were microwaveable entrees, followed by snack bars. Now four canned soups are making their way to market: Chicken Noodle, Veggie Noodle, Cream of Mushroom and Black Bean. Thanks to Tiffany at Celiac-Disease.com for the news. Australis Foods' Something Good gluten-free bread and cake mixes are now available at Amazon.com. A sale on a couple gluten-free products at Amazon warrants a mention. First, save up to 30% off on Think Thin breakfast products: save 15% using code THNK4009 at checkout and save an additional 15% (with free shipping) when combining with a Subscribe & Save order. Also, save up to 30% off on Pure Bar breakfast bars: save 15% using code PURBR643 at checkout and save an additional 15% (with free shipping) when combining with a Subscribe & Save order. Both deals run through April 30. It should be a great weekend to spend outside - enjoy the warm weather!